Find posts and abstracts for new research and scholarship on critical issues such as diversity and inclusion, ethical internationalization, global learning and teaching innovation, intercultural communication and understanding, and assessments and outcomes. Woldegiyorgis, Ayenachew A., Douglas Proctor, and Hans de Wit. 2018. Internationalization of research: Key considerations and concerns. Journal of Studies in International Education. Institute of International Education (IIE). 2018. Study abroad matters: Linking higher education to the contemporary workplace through international experience. New York, NY: IIE. Schulmann, Paul, and Cindy Le. 2018. Navigating a new paradigm for international student recruitment. New York, NY: World Education Services. McConachy, Troy. 2018. Critically engaging with cultural representations in foreign language textbooks. Intercultural Education. Duerden, Mat D., et al. 2018. Understanding the unique nature of the adolescent study abroad experience. Journal of Hospitality, Leisure, Sport & Tourism Education. Weekly and monthly bibliographies in the library. Find a compilation of new research and scholarship in one place. Discussions, questions, commentary in the discussion forum. Where are the current gaps in international education research and scholarship? How do we integrate global learning across curricular and cocurricular programming? What resources are being used (and considered useful) in research? 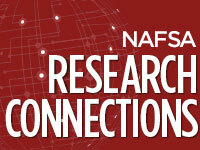 For questions, please send an email to research@nafsa.org. Learn more about assessing research relevance.